Fitness trackers aren’t known for blending in. 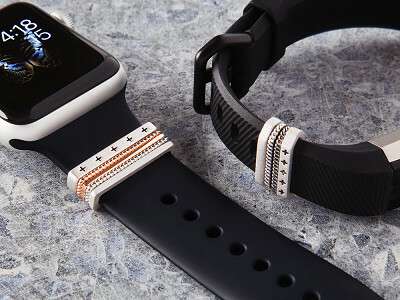 But this fitness tracker jewelry will add a sparkle to your existing tracker so it’ll enhance—rather than detract from—your look. Bytten’s stacked accessory rings turn a functional silicone band into something you’d wear even if you weren’t trying to improve your health. And you won’t have to slide the rings off when you exercise. They’re made to stay put and stay out of your way. Dress up your tech to give your fitness sense a sense of style. Do you have plans to design accessories for other Fitness trackers? Yes, we are working on several other exciting products. Stay Tuned! 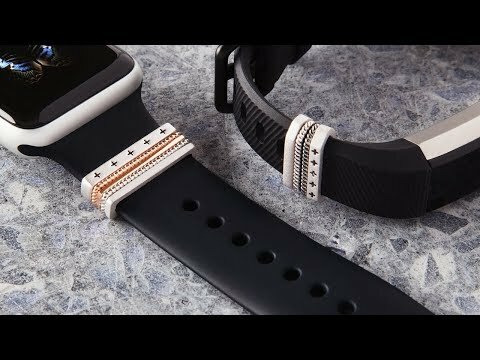 How do I care for my Wearable Stack Accessory Rings? The rings in our Wearable Stacks are plated with a variety of finishes to create custom looks. Plated jewelry is naturally susceptible to wear over time. To extend the life of your Classic Stack, we recommend limiting exposure to certain substances that can affect the appearance of the finish. 1. Wash your hands before putting on or taking off your Wearable Stack as frequent contact with creams, lotions, perfumes, and makeup can potentially affect the plated finish. 2. Do not wear your Wearable Stack while swimming as chlorine and other chemicals can produce adverse effects. Plated jewelry should be cleaned periodically. To clean your Wearable Stack, use warm water and gently wipe each ring separately with a soft cloth. Use mild dish soap if needed. Do not rub the rings together. Store your wearable stacks in a pouch or soft cloth separate from other jewelry. Hello everyone. I am Jodi Slater, Founder of Bytten. We make accessories to make your wearable tech as unique and beautiful as you are. I am proud to introduce Bytten to The Grommet and are happy to answer any questions you may have about our products. I'm really into Rose Gold - I can't decide between the Rose Classic and the Rose Twist. Which one would you recommend? @Jill Hi Jill - Thanks for your interest! The Rose Classic stack includes 5 rings one of which is the cut plus ring designed by Lucas Goossens to represent positivity. The Rose Twist stack is simple and elegant, and includes three rings one of which is the open screw motif. Please let us know if you need any more help with your decision! Fitness trackers aren’t known for blending in. 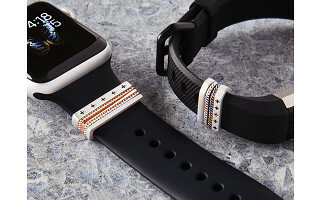 But this fitness tracker jewelry will add a sparkle to your existing tracker so it’ll enhance—rather than detract from—your look. Bytten’s stacked accessory rings turn a functional silicone band into something you’d wear even if you weren’t trying to improve your health. And you won’t have to slide the rings off when you exercise. They’re made to stay put and stay out of your way.